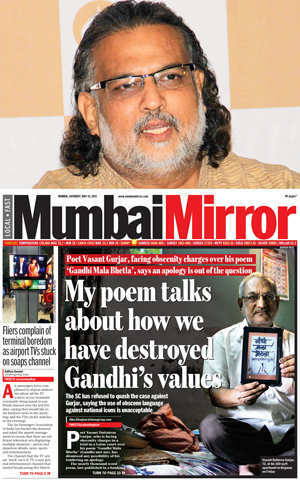 Gandhi said the Supreme Court has missed the point of the poem and failed to appreciate the longstanding tradition of ‘rebel literature’ in Maharashtra to which an aggressive, even offending style of writing is integral. The Supreme Court on Thursday refused to quash the trial against Gurjar, saying that the use of obscene language when referring to national icons is not acceptable. The nearly thousand-word poem, last published in a banking industry in-house magazine in 1994, revolves around the poet’s imaginary encounters with the Mahatma at temples, churches, mosques, at an Osho ashram, at the Kremlin and even in Mumbai‘s red light area among other places. Gurjar is suspected to be a mental case.He is required treatment/counciling.English rulers ,evenMandella respected his work and ideology. If some people behaved wrong or did not follow his teachings,then Bapuji can not be blamed.On the contrary his teachings should be published on and often to show positivity.The language used in so calledpoetry,is very bad and offensive.S.C.has remarked correctly and further such language should not be used for any person orthings. So called Big persons like Nemade and Tusharbhai should read literatre again and again to know real Bapu.Sabko sanmati de bhagwan.